Lying in a hospital bed, with his eyes buried underneath thick bandages, it seems to Bill Masen that he must be the only person who is missing the display. The announcer on the six o’clock news described it as an amazing scene that was not to be missed and now, according to Bill’s nurse, thousands of people are in the parks and on the heath, and very much not missing it. People have even climbed onto flat roofs to get a better view and all of the curtains in the hospital have been pulled wide open so that the patients don’t miss anything. “It’s such a pity that you can’t see it,” the nurse tells him. The following morning meteors and shooting stars are the last thing on Bill’s mind because his bandages are due to be taken off and he’s eagerly awaiting the doctor. The doctor doesn’t come though. Nor does breakfast for that matter and the hospital seems unusually quiet, as do the streets below his window. Bill can’t hear any traffic at all and he gets so worried that he presses the bell to summon the nurse, but the nurse, like the doctor and his breakfast, does not arrive. Eventually, Bill has no choice but to take off his own bandages and he soon discovers that the spectacular astral display the night before has blinded everyone who saw it. Ironically, Bill who now can see finds his doctor and discovers he is blind. The doctor, not wanting to face this strange new world of the blind leading the blind, commits suicide by throwing himself through a plate glass window. When Bill leaves the hospital he finds that a lot of people are killing themselves. A lot are also killing each other and the streets can be a dangerous place to be, even for someone who still has a fully-functioning set of peepers. Bill manages to find a few other people who can see, but there are not many of them. He also discovers that the triffids have not been slow in taking advantage of the situation. The triffids are a rather unusual species of plant that are capable of pulling up their roots and walking. The idea of perambulating plants is frightening enough, but these plants can sting too, and a triffid sting is usually fatal. The Day of the Triffids was first published in 1951. Because of this, the language that’s used is perhaps a little dated. I can’t, imagine too many nurses these days saying: “They make people’s faces look frightfully ghastly.” In general, I prefer to read a book where the language has a more modern feel to it, because I find it easier to be pulled into the story and to sympathize with and care about the characters. If, on the other hand, I am not comfortable with the language it usually breaks the spell sufficiently enough for me to put aside the book in question and give it up as a bad job. I am glad to say that I was not forced to put aside The Day of the Triffids. After reading a few pages I managed to get used to the voice of Bill narrating the story. I was pulled in and retained my interest all the way to the end of the book. My copy of The Day of the Triffids contains an introduction by Barry Langford. In his introduction Langford details some of the comments that the story makes on subjects like the cold war and biological and nuclear warfare etc. Langford also makes comparisons between Wyndham’s story and H G. Well’s The War of the Worlds. I think that a lot of readers might find this introduction interesting but, to be honest, I never finished reading it. I found it boring, and was more interested in the fiction than in any hidden statements or politics. 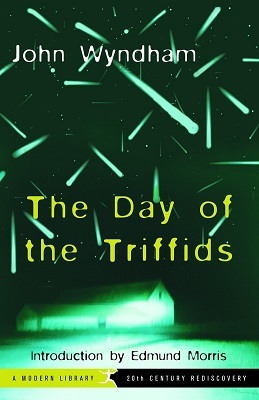 The Day of the Triffids is an enjoyable book and although it may be of particular appeal to fans of the sci-fi and horror genres, it is will probably be just as suitable for a more general readership—especially those who have watched and enjoyed any of the movies or TV series the book inspired.